Possible adult male (note differences in body shape compared with previous and following images). 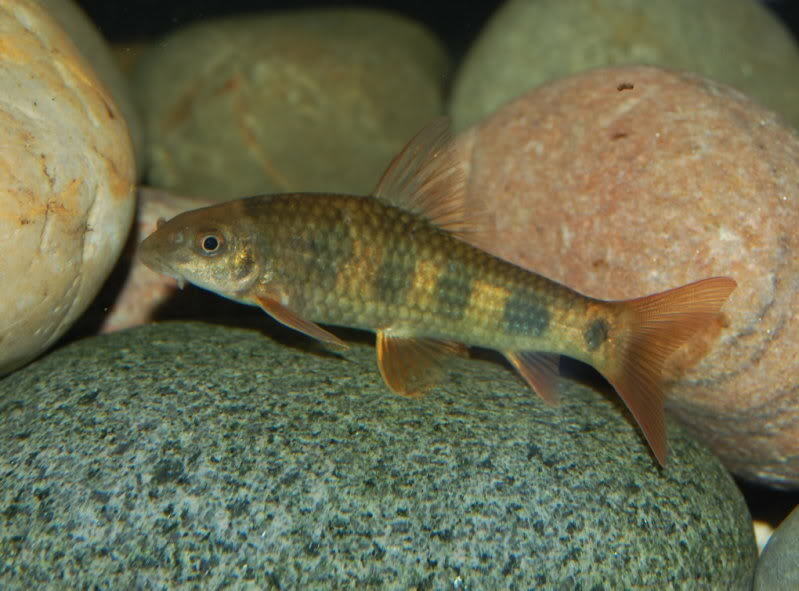 Garra: vernacular Gangetic name for a particular species of “sand-digger,” which Francis Buchanan-Hamilton applied as a generic name for bottom-dwelling cyprinids “with no affinity to another genus”. spilota: from the Ancient Greek σπιλωτος (spilotos), meaning ‘stained, spotted’, in reference to this species’ colour pattern comprising a series of dark blotches along the flanks. Probably endemic to the Rakhine Yoma/Arakan mountains in Rakhine state, western Myanmar, a range forming a natural barrier isolating most the area from the remainder of the country. It was originally collected in 1998 from the Naung Pin Thar Chaung, a small stream within the Irrawaddy watershed which runs alongside a logging road and drains the eastern face of the Rakhine Yoma. Subsequent commercial collections may have occured at additional localities as Kullander’s team had only four days in which to complete their fieldwork and this proved insufficient to explore the region fully (S. O. Kullander pers. comm.). Type locality is ‘Irrawaddy River drainage, Naung Pin Thar Chaung, a small stream at logging road about 1 kilometer from Ngathaingchaung-Gwa road, 17°31’44″N, 94°48’46″E, Ayeyarwaddy Division, Myanmar’. The type locality is located in a hilly area mostly comprising bamboo forest. At time of collection the water was clear, colourless and flowing at a moderate pace over a substrate of rocks and gravel. It was 1-2 metres wide and maximum depth was only 0.5 metres. Due to the surrounding forest some stretches were shaded and others more open. Sympatric species included Garra poecilura, Homaloptera modesta, Mystus pulcher and Xenentodon cancila alongside unidentified members of Danio, Schistura, Syncrossus and Channa. The largest specimen in the type series measured 69 mm. An aquarium with base measurements of 90 ∗ 30 cm should be the smallest considered. Not difficult to keep in a well-maintained set-up, but a display arranged to resemble a flowing stream or river, with a substrate of variably-sized, water-worn rocks, sand, fine gravel and perhaps some small boulders, is highly recommended. This can be further furnished with driftwood roots or branches, and hardy aquatic plants such as Microsorum, Bolbitis, or Anubias spp., which can be grown attached to items of décor. Most importantly, the water must be clean and well-oxygenated with turnover preferably in excess of 10 times per hour; additional powerheads and airstones can be employed to achieve the desired flow and oxygenation if necessary. Bright lighting will promote development of biofilm on solid surfaces, upon which the fish will graze. Since it needs stable water conditions and grazes biofilm this species should never be added to a biologically immature set-up, and a tightly-fitting cover is necessary since it can literally climb glass. Although it will graze algae if available this species is not an exclusive herbivore. Offer meaty foods such as live or frozen chironomid larvae (bloodworm), Tubifex, Artemia, chopped prawn, etc., along with good quality, sinking dried products, at least some of which should contain a significant proportion of vegetable matter such as Spirulina or similar. Fresh fruit and vegetables such as cucumber, melon, blanched spinach or courgette can be offered occasionally and home-made, gelatine-bound recipes containing a mixture of dried fish food, puréed shellfish, fresh fruit and vegetables, are also proven to work well. Relatively peaceful and makes a good subject for the well-chosen, larger community of stream-dwelling Indochinese species. It seems to appreciate the company of its own kind and is not as territorial or competitive with conspecifics as some Garra spp. A group of at least of 3-4 specimens should be considered the minimum. Though many Garra spp. can be sexed by the degree of tuberculation on the snout and head, with males usually possessing more prominent development, this feature is described as only ‘rudimentary’ in G. spilota. Mature females are likely to be rounder-bodied than males, though, especially when gravid. 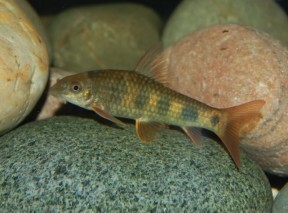 G. spilota is among the more attractive species in the genus and is occasionally available in the aquarium trade. It is distinguished from all other Garra species by possessing reddish fins, a series of dark blotches on the flanks, and unique upper lip structure consisting of a soft lining with growths of unculi. It also lacks rostral lobes and differs from the similar G. flavatra in some meristic counts. The genus Garra is a particularly enigmatic grouping with new taxa described on a regular basis, while many of the existing ones may represent cases of misidentification or synonyms of other species. Some of the revisions have also been called into question, which has added further confusion. A full generic review would be ideal but is unlikely to materialise given the extensive distribution of its members which range from southern China across much of southeast Asia, India and the Middle East as far as north/central Africa. Instead a number of less-extensive works published in recent years have resulted in a gradual, but continuing, improvement in knowledge, and it remains possible that the genus will be broken up into smaller taxa since the current assemblage is almost certainly polyphyletic. Garra species are usually included in the subfamily Labeoninae/Cyprininae or tribe Labeonini (name varies with author) which by recent thinking is further divided into four subtribes; Labeoina, Garraina, Osteochilina, and Semilabeoina (Yang et al., 2012). The putatively monophyletic Garraina comprises a number of genetic lineages including Garra sensu stricto (which also includes Horalabiosa, Phreatichthys and possibly other genera), a small clade comprising Garra cambodgiensis and G. fascicauda (thus rendering Garra polyphyletic), Paracrossocheilus, and Gonorhynchus (which includes Akrokolioplax). 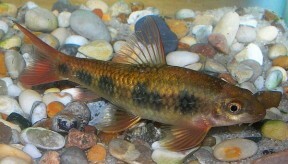 Two Garra species, G. imberba and G. micropulvinus, are placed in the Semilabeoina assemblage, and the generic name Ageneiogarra Garman, 1912 has been suggested for them, although this does not appear to have been widely followed (e.g. Kottelat, 2013). 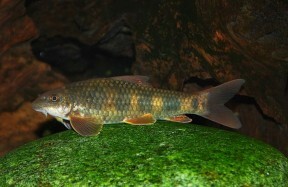 In addition, some genera which were previously considered to be close relatives of Garra species such as Discogobio, Discocheilus and Placocheilus, are now also placed in this subtribe. All genera currently included in Garraina possess a lower lip modified to form a mental adhesive disc, allowing the fish to cling to surfaces in turbulent conditions. In most species the upper lip is almost entirely reduced and both the upper and lower jaw margins are keratinised, i.e., horny, and used to scrape food items from the substrate. Garra species are distinguished from other Garraina members by the first two pectoral-fin rays usually being thickened, fleshy and unbranched, possession of 10-11 dorsal-fin rays, and a combination of internal characters. Some species have evolved particular environmental specialisms such as highly reduced eyes in hypogean forms or the ability to survive in thermal springs. Seven new species of Garra (Cyprinidae: Cyprininae) from the Rakhine Yoma, southern Myanmar. 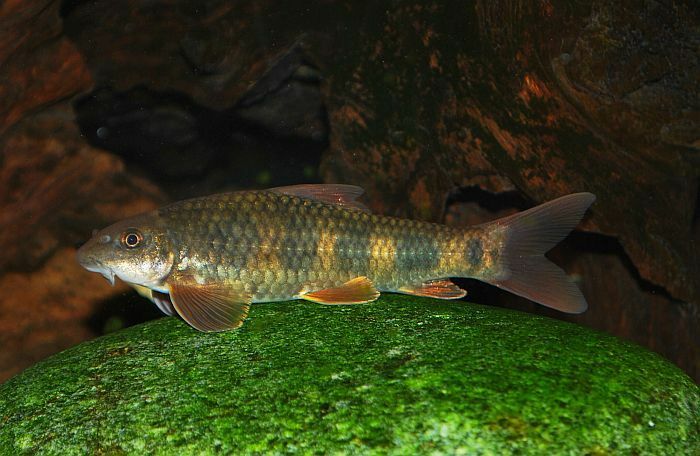 The fishes of the inland waters of southeast Asia: a catalogue and core bibiography of the fishes known to occur in freshwaters, mangroves and estuaries. An overview of labeonin relationships and the phylogenetic placement of the Afro-Asian genus Garra Hamilton, 1922 (Teleostei: Cyprinidae), with the description of five new species of Garra from Ethiopia, and a key to all African species. Molecular phylogeny of the cyprinid tribe Labeonini (Teleostei: Cypriniformes). Phylogenetic relationships of labeonine cyprinids of the disc-bearing group (Pisces: Teleostei).